This week, I took a little break from nail art. Yeah, it's super fun but sometimes I just don't have the patience to try, you know? Sometimes, it's nice to just paint them, but that doesn't mean there can't be a little pizazz! Okay, so technically, my middle finger is a gradient but aside from that, this is a nail-art-free mani. Ha! Feature Fingers: Two coats of Paper Mache, followed by half coat of Peacock Portrait. Other Fingers (from pointer to pinky): Two coats of Skinny Dip, gradient with Skinny Dip and Mackenzie, and then two coats of Mackenzie. Once I was finished, though, I realized that something was missing. 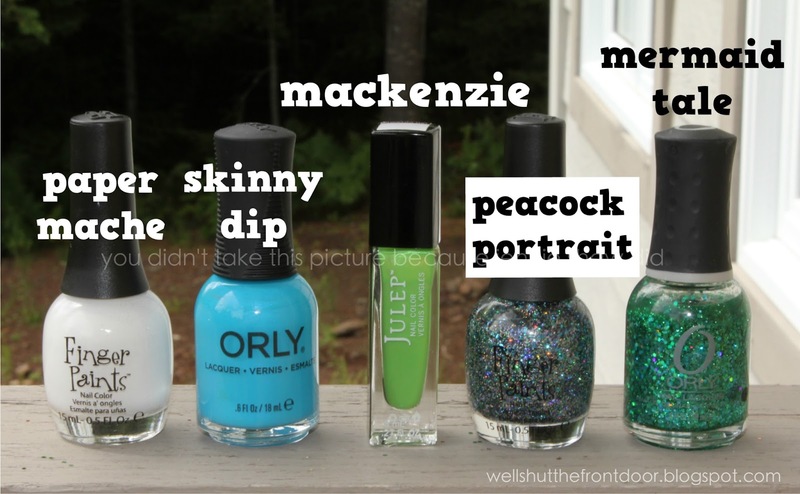 Peacock Portrait is lovely with its dainty blue, green, and silver sparkles, but the coverage isn't the best so I went to my trusty rack-o-polish for one of my fave green glitters: Mermaid Tale. And as you can see from the two pictures, I think I can say for certain that two glitters are better than one. The whole thing took me about 25 minutes (even with the addition of Mermaid Tale) and the best tip I can share about working with polishes that have variously sized chunks is this: don't use the brush that comes with the bottle. I'm guessing that right now, you're all: Whaaaaaaaaat? The brush that comes with chunky glitter is the same that you'd find in any nail polish bottle, and that's a problem because you can't control where the glitter goes. Most times (for me, anyway) the brush will have either too much or too little glitter and it doesn't go on evenly. I have no idea why nobody's figured out a better brush situation (*stares at China Glaze, ORLY, Finger Paints, and OPI*) but it is what it is. If you happen to have a smaller brush handy, though, it makes placing the glitter chunks a total breeze. Drop a few gobs on a piece of paper and "pick out" the glitter with the brush. Then, apply it wherever you want it to go! That's how I was able to have the glitter look like it's fading upwards, and it's seriously super easy with a little brush (and way less messy!). You don't have to do a full coat of polish either because when you apply the top coat (which everyone does, right? *peers over glasses*) that layer will even everything out. Yay! I just found your blog other day via Fashionista Next Door (one of your linker uppers) and I gotta tell you, I absolutely LOVE your humor! I can tell you're writing the way you speak, something I adore in a writer. Everything here (blog title, tag line, bio, etc) has made me chuckle. I enjoy a good laugh & also don't sugarcoat the quirk on my blog. Thank you! Just kidding! That's way more than I'd ever have the patience for and it looks so cute! Love them!!! I want to try the gradient nail!! Excellent choice adding the 2nd glitter - it looks great! And yeah what the heck is the deal with the powers-that-be not having figured out a better glitter polish brush situation? WHAT THE HECK. They look very pretty. I haven't done anything fancy lately. I need to soon. Looks gorgeous with both glitters! I finally got my gradient to look right and then I come over here and once again I'm blown away! I LOVE this color combo! why thank you! hahaha i love you justifying my buying nail polish! 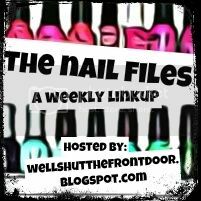 Thanks for hosting the link up, and I always look forward to seeing what new ideas and colors you use on your nails because their always so pretty.